Virginia is playing a pivotal role in national health reform as Senate Majority Leader Harry Reid aggressively courts Sen. Jim Webb&#39;s support in his quest for 60 votes for health reform. Democrats are ready to cut virtually any deal to get their bill passed, and some, like Louisiana&#39;s Sen. Mary Landrieu, appear willing to sell out one-sixth of the U.S. economy for a few hundred million dollars in Medicaid money. While Sen. Mark Warner has voted in lockstep support for Sen. Reid&#39;s $2.5 trillion monstrosity, Webb has showed a willingness to consider amendments to the bill and to put principle first. Webb arguably provided the decisive vote to bring the bill to the Senate floor for debate last month. Now, the biggest determinant for whether the Senate bill becomes law lies with whether he joins at least 59 of his colleagues in voting to move the bill toward final passage. &bull;Costs will go up: People rightly wonder how health reform legislation will impact their ever-increasing health insurance premiums. They remember President Obama promising that his plan would reduce health insurance premiums by up to $2,500 a year. Unfortunately, independent experts find the Senate bill will cause premiums to rise even more than already expected for millions of Americans. Families purchasing insurance in the individual market will be hardest hit, with premiums $2,100 higher than if Congress did nothing. Small businesses expecting relief will be sorely disappointed since the Congressional Budget Office says their costs will continue their rapid rise. And premiums could double for many young people. Bill proponents quickly assert that some people would see lower premiums because they would qualify for subsidies. But this is just another Washington budgetary game. These subsidies aren&#39;t free. Guess who pays for them? That&#39;s right — taxpayers like you and me. And only about 20 million Americans will qualify for the premium subsidies, even though everyone will be required to carry government-approved health insurance. &bull;Taking away your current coverage: President Obama assured Americans during his September speech to the joint session of Congress that &quot;Nothing in our plan requires you to change what you have.&quot; But even Democratic Sen. Bob Casey from Pennsylvania acknowledges that the $120 billion cut to the Medicare Advantage program will force many seniors to lose coverage in their private health plans. &quot;We&#39;re not going to be able to say &#39;If you like what you have, you can keep it,&#39;&quot; Casey said. Webb voted with Republicans for an amendment to stop the cuts to Medicare. &bull;Higher taxes: The plan includes about $500 billion in tax hikes, including tax penalties on middle-class Americans who do not purchase government-approved health insurance. A group of business leaders sent a letter to Reid saying that the taxes in his bill will fall &quot;disproportionately on the backs of small business [and] will lead to higher costs and increased burdens on small businesses.&quot; They added that they have &quot;grave concerns about the bill&#39;s far-reaching impact on business costs, the economy, and our nation&#39;s health care system.&quot; &bull;Cuts in payments to hospitals: Hospitals are staring at $135 billion in cuts, with rural hospitals expected to be hit hardest because of their tight operating margins. Nursing homes and home health agencies face a disproportionate share of spending cuts. &bull;A plan we cannot afford: Virginia would have to add all citizens to Medicaid who earn up to 133 percent of poverty, about $30,000 for a family of four. While the federal government would pay the added costs of the expansion for three years, the state could face millions of dollars of added Medicaid costs in the future. With the state struggling to meet current obligations, this would surely require new taxes or more cuts to other essential programs. Virginians understand that legislation loaded with Washington mandates and new entitlements inevitably leads to unchecked federal spending — spending neither Virginia nor the nation can afford. Well over half of Virginia voters oppose the congressional health reform plan. Town hall meetings and polls show Americans want Congress to go back to the drawing board. Jim Webb will play a large role in determining whether Virginians feel they are being heard in the health care debate. Published in the Richmond Times-Dispatch, Dec. 20, 2009. Virginia is playing a pivotal role in national health reform as Senate Majority Leader Harry Reid aggressively courts Sen. Jim Webb's support in his quest for 60 votes for health reform. Democrats are ready to cut virtually any deal to get their bill passed, and some, like Louisiana's Sen. Mary Landrieu, appear willing to sell out one-sixth of the U.S. economy for a few hundred million dollars in Medicaid money. While Sen. Mark Warner has voted in lockstep support for Sen. Reid's $2.5 trillion monstrosity, Webb has showed a willingness to consider amendments to the bill and to put principle first. •Costs will go up: People rightly wonder how health reform legislation will impact their ever-increasing health insurance premiums. They remember President Obama promising that his plan would reduce health insurance premiums by up to $2,500 a year. Unfortunately, independent experts find the Senate bill will cause premiums to rise even more than already expected for millions of Americans. Families purchasing insurance in the individual market will be hardest hit, with premiums $2,100 higher than if Congress did nothing. Bill proponents quickly assert that some people would see lower premiums because they would qualify for subsidies. But this is just another Washington budgetary game. These subsidies aren't free. Guess who pays for them? That's right — taxpayers like you and me. And only about 20 million Americans will qualify for the premium subsidies, even though everyone will be required to carry government-approved health insurance. 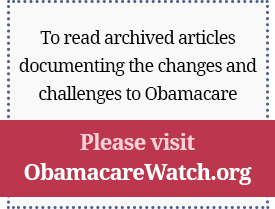 •Taking away your current coverage: President Obama assured Americans during his September speech to the joint session of Congress that "Nothing in our plan requires you to change what you have." But even Democratic Sen. Bob Casey from Pennsylvania acknowledges that the $120 billion cut to the Medicare Advantage program will force many seniors to lose coverage in their private health plans. "We're not going to be able to say 'If you like what you have, you can keep it,'" Casey said. Webb voted with Republicans for an amendment to stop the cuts to Medicare. •Higher taxes: The plan includes about $500 billion in tax hikes, including tax penalties on middle-class Americans who do not purchase government-approved health insurance. A group of business leaders sent a letter to Reid saying that the taxes in his bill will fall "disproportionately on the backs of small business [and] will lead to higher costs and increased burdens on small businesses." They added that they have "grave concerns about the bill's far-reaching impact on business costs, the economy, and our nation's health care system." •Cuts in payments to hospitals: Hospitals are staring at $135 billion in cuts, with rural hospitals expected to be hit hardest because of their tight operating margins. Nursing homes and home health agencies face a disproportionate share of spending cuts. •A plan we cannot afford: Virginia would have to add all citizens to Medicaid who earn up to 133 percent of poverty, about $30,000 for a family of four. While the federal government would pay the added costs of the expansion for three years, the state could face millions of dollars of added Medicaid costs in the future. With the state struggling to meet current obligations, this would surely require new taxes or more cuts to other essential programs.